"The most damning evidence of racism is the rise of the segregation academies in Mississippi just as school integration is taking place," an expert told NBC News. The 1954 landmark Supreme Court decision Brown v. Board of Education mandated that public schools in the United States desegregate, but it took more than 15 years for Mississippi and other states in the South to catch up to the order — and many found ways to circumvent the new system. About 200,000 students moved to private schools between the 1960s and 1980s immediately after a series of Supreme Court decisions that began with that 1954 case. Two-thirds of those students came from six states: Alabama, Georgia, Louisiana, Mississippi, North Carolina, and South Carolina, according to the Southern Education Foundation. After Mississippi Gov. John Bell Williams, who historically supported segregationist policies, enforced the order in the winter of 1970, many white families in the state helped establish or escaped to private academies, which remained predominantly white and became commonplace in the state. These so-called segregationist academies created barriers for entry — whether monetary or through unstated discriminatory practices — that black students could not overcome. Today, while some argue that the prevalence of these private schools in states like Mississippi is because public schools there are deteriorating, experts point to the founding of these schools to show a troubling racist history that was never addressed. The Jackson Free-Press brought the issue to the forefront when it reported on Friday night that Republican Sen. Cindy Hyde-Smith attended Lawrence County Academy in Brookhaven, Mississippi, during the 1970s. The now shuttered school was founded in 1970 to flout the integration order and had a confederate general mascot, according to the local weekly. Hyde-Smith on Tuesday faces a contentious run-off election for Mississippi's Senate seat against former Secretary of Agriculture Mike Espy, who is black. A 2012 Southern Education Foundation study found that while only 50.6 percent of school-age students in Mississippi are white, nearly 87 percent of private school enrollment is white — a stark contrast to their black enrollment of 9 percent. Though Mississippi consistently remains the top state in this onerous category, this system is in play throughout the 15 states that make up the South, the same study found. In this region, the average number of white students enrolled in private schools exceeded that of white student enrollment in public schools by 20 percent in 2012. Can Espy pull off an upset in Mississippi runoff election? “The most damning evidence of racism is the rise of the segregation academies in Mississippi just as school integration is taking place,” said Richard Kahlenberg, a senior fellow at the Century Foundation and an expert on American education and segregation. But it's not just her enrollment at Lawrence County Academy that has earned Hyde-Smith criticism. In the weeks since Election Day, with the run-off on the horizon, Hyde-Smith has made a series of racially tinged comments that have drawn strong condemnation. Hyde-Smith has been caught on video joking about "attending a public hanging" and stating that voter suppression is a "great idea." Those statements lost her the support of multiple corporate donors. 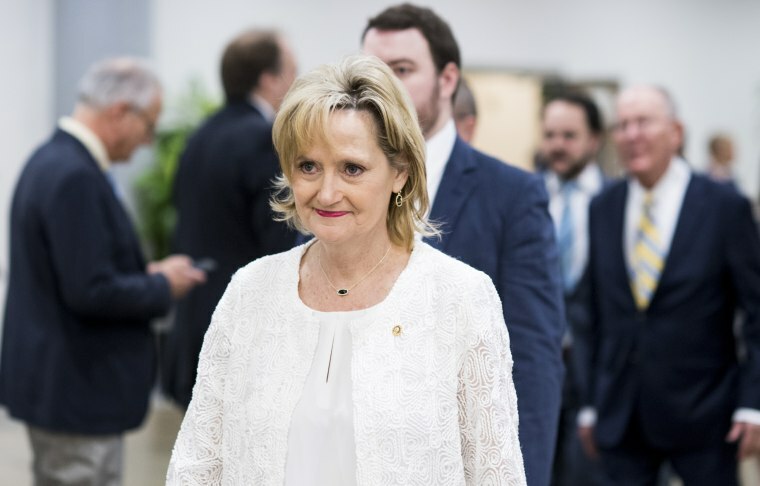 Her critics also pointed out the senator's apparent disregard of Mississippi history that includes 581 lynchings from 1882 to 1968, the most of any state in that period, according to the NAACP. It took nearly a week for Hyde-Smith to apologize for the first remark, and she read from a pre-written statement at a live televised debate. Now, with President Donald Trump set to hold two campaign events in Mississippi for her on Monday, she has come under fire again over segregation academies — this time for enrolling her daughter at Brookhaven Academy, also considered a segregation academy. The sitting senator, however, is not the first candidate running for office in Mississippi to come under fire for sending their child to a so-called segregation academy. An article in the Clarion-Ledger from June 18, 1987, found that three of that year's Democratic gubernatorial candidates — all public education advocates — enrolled their kids in private schools. One of the three candidates enrolled their child in a school that was founded by the White Citizens Council, a white segregationist group that advocated for these types of academies. That system has not changed much since the 1970s when Hyde-Smith went to school and desegregation began in earnest in Mississippi, and it remains integral to some upper-middle class white families in the state today. It is that history and division between public schools and private schools that should inform policy makers in the future, Kahlenberg told NBC News, because it is state sponsorship that allowed segregation academies to grow in the past. "It wasn't just that white families exited the public school system when integration began in earnest," he said. "It was worse than that because the state of Mississippi and other states began offering private school vouchers to support this effort to bypass integration." Today conservative policymakers are typically in favor of voucher programs, and Kahlenberg said that concept is grounded in the debate around these segregation academies. "The conservative support for private school vouchers needs to grapple with this ugly history of how private school vouchers originated in the South to support segregation," said Kahlenberg. "To me, that's why that history is so important today."